II. 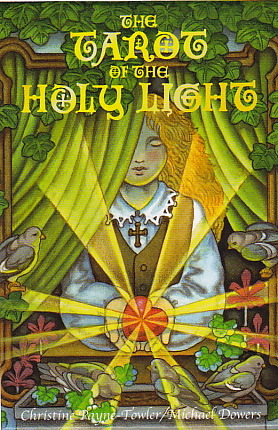 Order our new Tarot of the Holy Light Deck ...You can order our new Deck at http://www.tarotuniversity.com! NewMoon at 4+ Libra, on Tuesday, September 27th at 7:10 AM (EDT) / 4:10 AM (PDT). From this moment, the Moon begins to wax, or increase. 2nd Quarter, Waxing Half Moon at 10+ Capricorn on Monday October 3rd at 11:16 PM (EDT)/ 8:16 PM (PDT). Full Moon at 18+ Aries onTuesday October 11th at 10:07 PM (EDT) / 7:07 PM (PDT). From this moment, the Moon begins to wane, or decrease. 4th Quarter, Waning Half Moon at 26+ Cancer, on Wednesday, October 19th at 11:31 PM (EDT) / 8:31 PM (PDT). Next NewMoon at 3+ Scorpio, Wednesday, October 26th, at 3:57 PM (EDT) / 12:57 PM (PDT) . From this moment, the Moon begins to wax, or increase.